The certified K-9 LEO is a key member of the force, and is called on to serve. Recent stories in the news of K-9 officers attacked by the suspects they are apprehending highlight the importance of protecting these heroes in the line of duty. 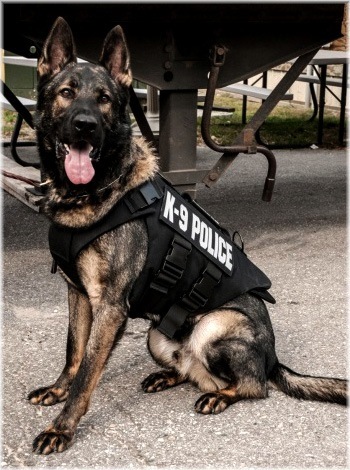 The Connecticut Police Work Dog Association webpage lists K-9s from across the nation who died in service, by state, and more than a few have been listed as “shot/hostile gun fire.” There is ballistic/stab protection available for these officers, and Sandy Marcal is on a mission to provide K-9 vests for all of them. Sandy Marcal fit an interview with At the Ready into her very busy day as the president of the non-profit that provides ballistic and stab protection for working dogs. Sandy was inspired by Rain, a Military Working Dog who served in Vietnam. Back in 2000 she started volunteering to raise money because dogs had no access to vests. In 2009, she formed the non-profit Vested Interest for K-9s, and has provided vests for over 430 dogs across the country in the last four years. The vests for the dogs are free to the law enforcement agencies. Sandy works tirelessly along with many volunteers nationwide to raise funds for these vests. On her website there are tabs to volunteer, donate, host a fundraiser, shop in the online store and even just invite VIK-9s to your event. She never passes up a chance to spread the message about how important these K-9 Officer partners are. Her organization hosts a “Hog Wild for K-9s” motorcycle ride (see the 2013 press release that appeared in At the Ready). The last one, hosted in 2011, raised $16,000 and vested 16 dogs. Ongoing events include the Vested Interest in K9s Strong , honoring the K-9s who were Boston Strong and served during the marathon bombing, with 50% of the artwork 8x10 prints sold going to the cause. 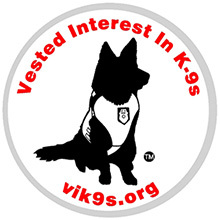 Other volunteers hold events throughout the year for Vested Interests in K-9s. Runs, rides, car washes, dog washes, you name the event, and chances are one of Sandy’s network of animal lovers has hosted one. Beyond fundraising events, the organization has entered into partnerships to provide vests as well. "Pet Armor, (the provider of flea and tick prevention), has entered into a one year partnership with us, donating vests for 25 K-9s in Austin, TX, Jupiter, FL, Riviera Beach, FL and Baltimore MD,” Sandy says.